Mark Hackett, Director of Instruction at Old Palm Golf Club, just added one more accolade to his long list of professional distinctions. He was recently voted one of Floridaâs best golf teachers by a distinguished panel of 1,200 of Americaâs leading golf instructors. Being recognized by his peers is particularly rewarding for Hackett because the panel fully understands what it takes to be a phenomenal teacher. The results of the vote are listed in the November 2013 issue of âGolf Digest,â which is now available on line and in print. Members of Old Palm that have taken lessons from Hackett know firsthand how helpful his instruction can be. Hackett has a knack for explaining even the complexities of the swing in easy-to-grasp terms and then showing members how they can quickly adjust their games for maximum results. 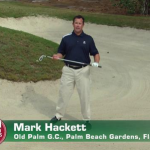 Several of Hackettâs instructional videos are on Old Palmâs website, including ones that address common situations like slicing the ball, blasting out of a fairway bunker, and playing from a water hazard. Congratulations to Hackett for his selection as one of Floridaâs best golf teachersâa recognition that our members agreed with completely.